At first glance, it looks like fountains in 13 different cities are menstruating. But upon closer inspection, it's all just a cool (or is it absolutely disgusting?) 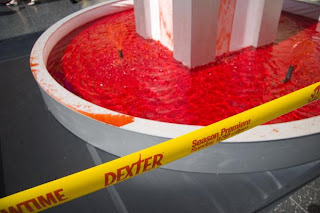 publicity stunt for Showtime's Dexter, which features America's most lovable serial killer and which returns for its second season this Sunday. I love this show, so I love this gross display right outside the Kodak Theatre on Hollywood at Highland in Los Angeles. It makes me want to drive down there, strip naked, and start splashing around. Isn't that what you want to do when you see fountains of blood?